One of the questions I get asked most often is how to make sales on Instagram. It’s what we all want! So we dig into some sales research and might come across the idea of a sales funnel. If you’re not familiar, google “sales funnel” and you’ll get a nice little image of an inverted triangle that leads your customer through various stages. There’s a few different ways they’ll label the stages, but essentially a sales funnel walks through the customer path of Awareness > Interest > Decision > Action. You know the one 🙄 … that they’ll find you on Instagram, you’ll slowly nurture them over time by getting them on your email list, writing great captions, providing value, sharing your brand story, getting them to engage with you, and then slowly but surely they make their way through from new follower to buyer. But what if that’s too simple? But it is “too simple” to think everyone has the same experiences with your brand, comes in with the same understanding of your product (or lack thereof), and needs to move through the funnel in the same series of steps. I’ve been re-thinking the way I discover and interact with brands on Instagram and while my results are just that – mine – I thought it’d be helpful to share + also challenge you to be aware of your own buying behavior. Please tell me I’m not the only one to fall wonderfully victim to impulse shopping on Instagram. And this has happened both with shops I’ve followed for awhile + brand new ones I literally just stumbled across. How did that brand position themselves to make sales on Instagram? What makes this purchase so easy and “gotta have it”? C | It’s been referred by a friend – she either has it / has talked about / or sent me a DM of it. … Soooo, notice any similarities between these three? You as the brand have VERY LITTLE CONTROL of my experience. Sure, you can show up and post a certain type of content…. You can’t necessarily “force a sale” with hard pitches. Sometimes it’s gotta be on my time. So your goal here is to just KEEP SHOWING UP — solidly on brand, laser-focused, serving your ideal customer. When she’s ready – she’ll decide. If I’m in this stage, it’s likely I’m already following the brand; and I need to see the product over and over again. For some reason, I’m not quite convinced I want to buy… I’m kinda dragging my feet going back + forth like, do I really need another striped shirt? In this stage, I can absolutely be influenced. I just need a nudge. Typically for me, that looks like seeing the product over and over again until I’m drooling (so to be clear: not as a sales pitch). Just hit me over the head with pretty + fun ideas again and again. It’s FOMO at its highest level. Show me all the beautiful pictures, talk about how to style it, show me how other’s have used it, create compelling Instagram stories that grab my attention. At this point I’m practically foaming at the mouth (or should I say, fomoing? …. ha, terrible) and waking up in the middle of the night to hit ‘buy’. Your goal here is to just shower your feed with irresistible value. SHOW – don’t tell. In this case, I love the visual feel of your brand or aspire to it, but don’t have an actual need or desire for your product. Not a great thing, but not a bad thing either. But I’m interested… I like the shop’s brand or messaging and I want to keep them in my peripheral so I can be a cool mom someday. I also do this with some more fashion-forward brands that I really love, but it’s just not practical for my current life situation (aka pretty basic work wardrobe needs + prefer being more casual on the weekends). This is the group I think a lot of us get hung up on. We start to question if we’re focused on the right topics, so we start to talk about unrelated things… just in case they’d be interested! But here’s the thing — if it’s not right for me, it’s just not right for me. Nothing a baby brand says will make me want to purchase right now. It’s not something I need. BUT by watching the brand continually show up for their customer + stay focused on what she needs, it’s naturally building trust with me (whether I realize it or not). When I see them respond to their customers’ comments, do cool customer features and giveaways, and provide education and encouragement to new parents…. I feel a sense of community I’d want to be part of, someday. Or if I take a new job downtown and want to up my wardrobe game… I know exactly who I’m turning to. Did I just completely strip away any sense of having a sales strategy on Instagram? Showing up with a clear brand story in your captions, a cohesive, repetitive (but varied) visual feed, and a strong focus on serving your ideal customer >>> you’ll naturally reach a buyer in any 3 of these paths. We can’t predict and personally cater to every customer journey on Instagram. You typically get one post up a day and maybe a few stories. So don’t go chasing sales. Focus on how you can show up for that ONE ideal customer. Focus on getting a conversation going. … That’s when you’ll naturally lead them from follower to buyer. Put yourself in the position to be there when they’re ready for you. 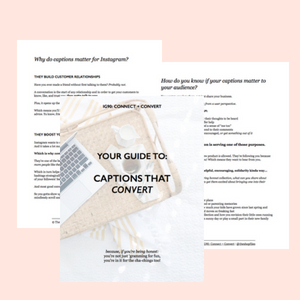 If you want help putting your content strategy together, from understanding why your customer wants your product, to what she needs to hear, and how to plan your posts so you align with your business goals, I’d love to help you inside IG90: Connect + Convert. And I’d LOVE to know… what are your buying habits on Instagram? Did any of these ring true for you? This post was originally shared to my Secrets of a Buyer email list subscribers!